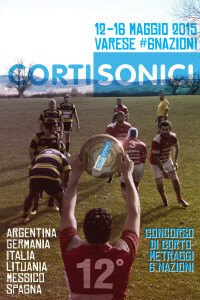 Cortisonici Six Nations is an international short film competition, which will take place at Varese between 12nd and 16th May 2015 and featuring works from Argentina, Germany, Italy, Lithuania, Mexico and Spain. Each of the six countries will be represented by one or more delegates, including the directors of shorts in competition, and an event – musci and gourmet – which is dedicated to. The competition itself, which will take place at the Cinema Nuovo of Viale Dei Mille in the evenings of Thursday 14th, Friday 15th and Saturday 16th, joined a series of screenings, meetings, cocktails and concerts that will accompany the entire week. Among the most important moments is the encounter/interview with Marcello Macchia, better known by his stage name Maccio Capatonda. Author, actor, father of some of the luckiest comedy catchphrases of the past few years, Maccio Capatonda was made known through for it was mocking and surreal works in short cut, and for this reason is an ideal artist to do from “Godfather” to the final awards. Fanta-night: marathon for sci-fi fans with short and feature films, including the acclaimed Autómata with Antonio Banderas and Melanie Griffith, of Spanish Director Gabe Ibáñez, already winner of the 2007 edition of Cortisonici. Cortisonici guys: section dedicated to movies made by young people, in schools and other educational contexts. Cortisonici Inferno: night with faulty projections section, wrong and extreme non stop. Themed evenings, to celebrate and discover known and unknown aspects of the host countries, the Lithuanian jazz to lucha libre. We will keep you updated on the detailed programme of the event. In the meantime, if you need a quiet place to stay during the days of the event, remember that Hotel Ungheria is in the heart of Varese, right next to the bus that in few minutes reach the Center.